Meanwhile, my shoes are dying. Ok, it is expected after going adventuring all over Singapore with them. I do hate going into stores so I usually check online for shoes to buy them instead. The upside is that I do get it delivered to me without meeting people at all and the bonus part is that the shoe box can be given to my cat. 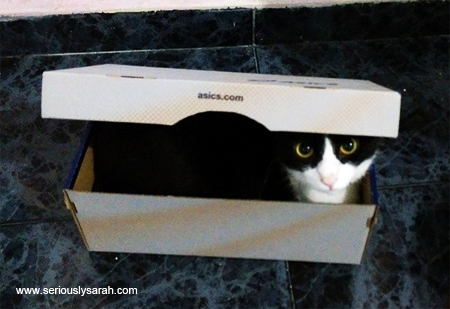 Dawn really likes shoe boxes and I like nice shoes. Reminds me of Leliana from Dragon Age. She’s a tough rogue but she loves nugs and shoes. What kind of shoes DO you guys like to wear anyway? Give me some suggestions I should try out instead of my regular adventure shoes.